With the advent of YouTube, Twitch and other video streaming platforms, the popularity of home video production has soared. As such, gadgets like ring lights have become increasingly popular with amateur creators as they offer bright, uniform lighting that gives videos a more professional feel. Many videos and streams feature a ‘talking head’ style of content. Ring lights excel in these videos, especially in popular content like video game streams or makeup tutorials, where the creator’s face is featured prominently throughout the video. A quick search on Google pulls up several videos about why you should use a ring light, where to get ring lights, which ring lights offer the best bang-for-your-buck, and so on. And, of course, that Google search brought many, many links to available ring lights on Amazon. One such light, Aukey’s Aura ring light, stands out from the rest. While not necessarily designed with video production in mind, this unique LED desk lamp works for many uses, from video to photography to just looking fly. I don’t make YouTube videos, and while I have streamed on Twitch occasionally, I wouldn’t call myself a streamer. However, when I first saw the Aura, my thoughts went immediately to reviving my long-dead Twitch channel with improved lightning, courtesy of Aukey. This wasn’t meant to be — my Twitch channel will stay dead for now — but I did find several other uses for the Aura. First and foremost, the Aura made for excellent photography lighting. I take a lot of photos of phones and other tech for work. However, when I work from home, it can be challenging to find good lighting to take pictures. The Aura has mostly solved that problem for me. While it isn’t perfect — frankly, the lighting in my apartment is abysmal at best — with some effort, the Aura can create unique scenes for my photos. 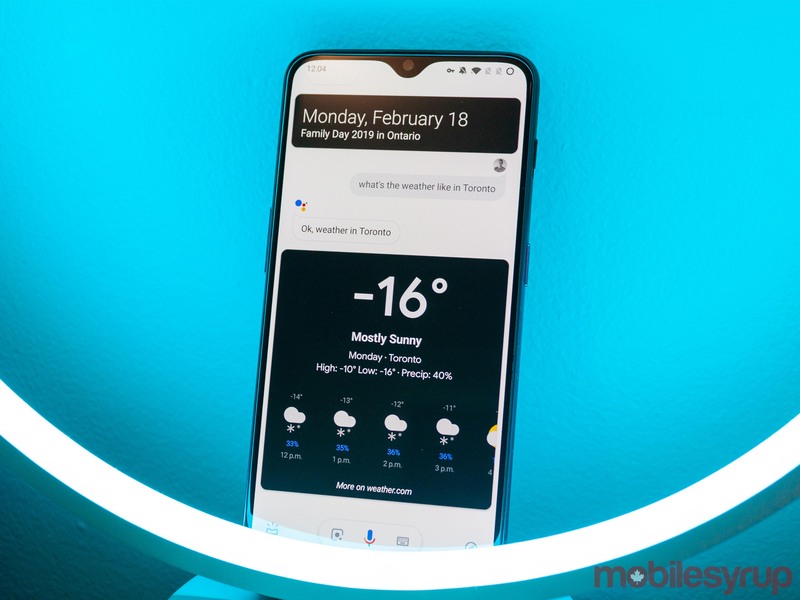 If you read MobileSyrup regularly, you may have seen the picture below heading a story about dark mode coming to Google Assistant. The Aura has several different colours it supports, including purple, turquoise, yellow, blue, green and red. Thanks to these colours, I can often tailor the scene to work precisely with the item I’m photographing. When I’m not on the job, the ring light makes for a great addition to my room. The white colour option is a nice warm light, not overly harsh. 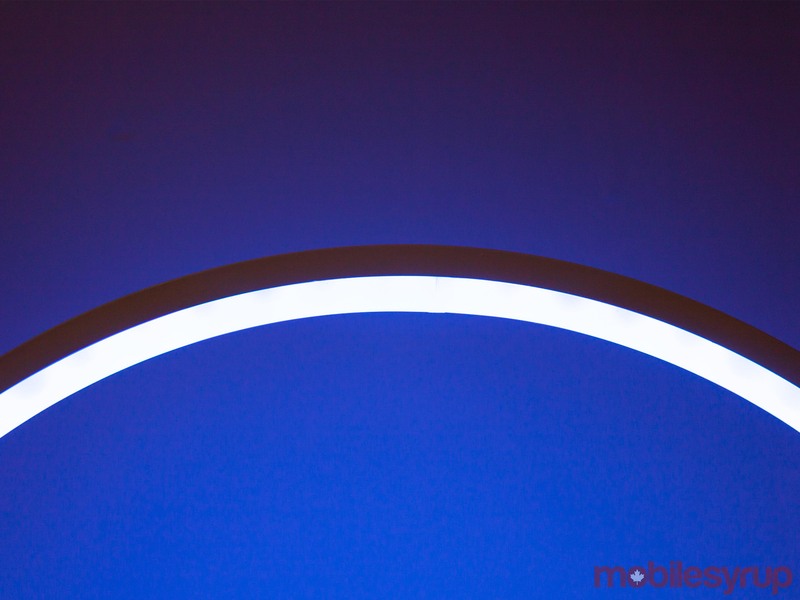 Plus, the brightness is adjustable, making the Aura an excellent reading light. Further, if I want something more exciting, the Aura offers several ‘moving’ light modes. Options include a ‘filling’ animation where the circle slowly fills up with light or a ‘breathing’ animation where the light pulses gently. There are also several ‘spinning’ options, with one colour, four colours and more. Finally, you can also pick ‘auto’ mode where the Aura will cycle through all the colours it supports. Overall, the Aura has a lot going for it. 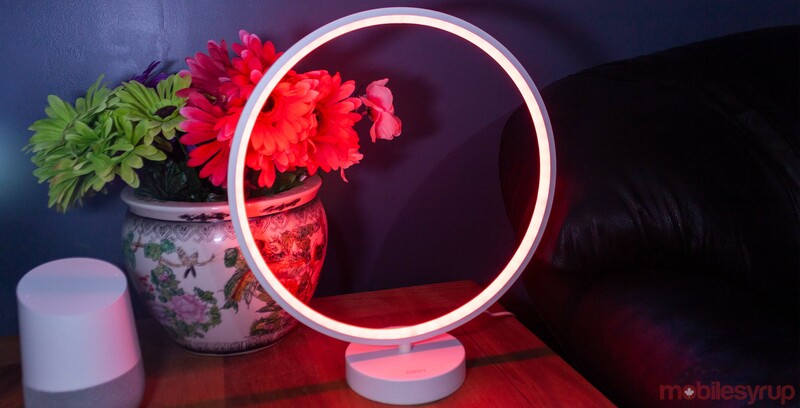 Thanks to the wealth of colours, animations and settings, this ring light can serve multiple purposes dutifully. However, there a few areas holding back the Aura. For me, the biggest issue with the Aura was its reliance on a remote control to function. To be clear, I don’t mean that the remote worked poorly. To the contrary, the remote worked exceedingly well — I could control the lamp with it from an entirely different room in my apartment. My first issue with the remote is its construction. Its plastic shell felt shoddy at times. Some buttons, mainly the centre ‘Mode’ button, would click other buttons if you pressed with any force. As for the buttons themselves, if you don’t have the user manual, it can be hard to determine what some of them do. I misplaced my manual shortly after setting up the light and spent most of my time with it testing buttons to see what they did. Thankfully, I learned later that Aukey allows you to download a PDF of the manual from their website, which includes instructions on which buttons do what. However, the whole experience of learning how to control certain features wasn’t great, especially considering that the remote is the only way to control the light. Worse, if the two triple-A batteries in the remote — which aren’t included — die, or if you lose or break the remote, it means you can’t control the Aura light anymore. It’s a frustratingly simple problem to solve, and there are a variety of solutions as well. For one, the base of the light could have featured a few control buttons. 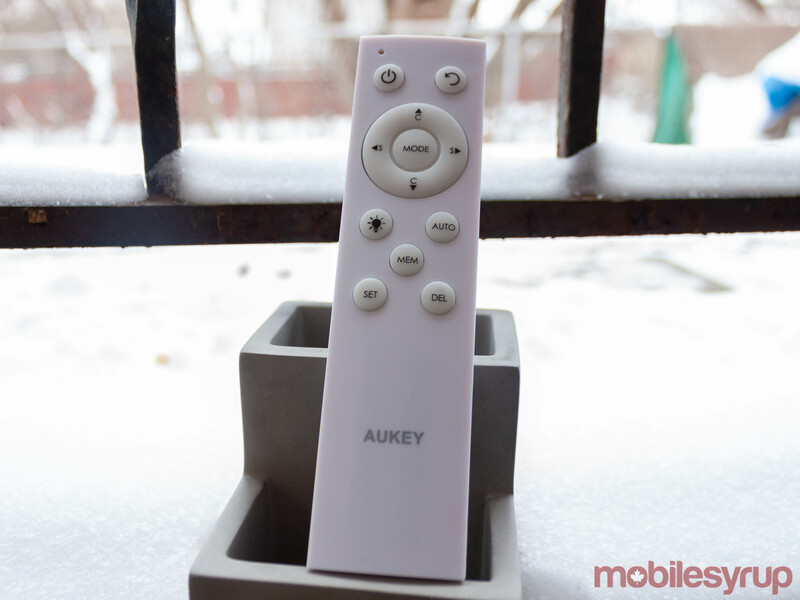 Alternatively, Aukey could have made the remote rechargeable, so users wouldn’t need to worry about batteries. Better yet, why not allow users to control the light with an app on their phone? Aukey already has a ‘Home’ app for controlling its smart gadgets — that same tech could easily extend to this light. And for that matter, I should be able to control the Aura with Google Assistant or Alexa. Any or all of these solutions would have significantly improved the usability of the Aura light. Instead, the omission of these features stands as a glaring flaw. One other nitpick I had with the lamp was that its cord was quite short. It’s hardly a deal breaker, but I did find it restricted my options regarding where I could plug it in. 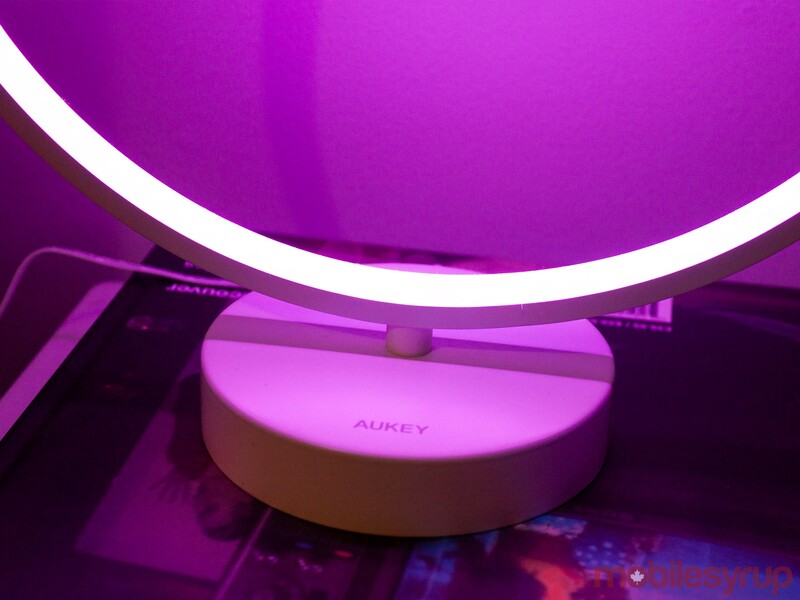 Aukey’s Aura light stands out for its ability to fill many needs. 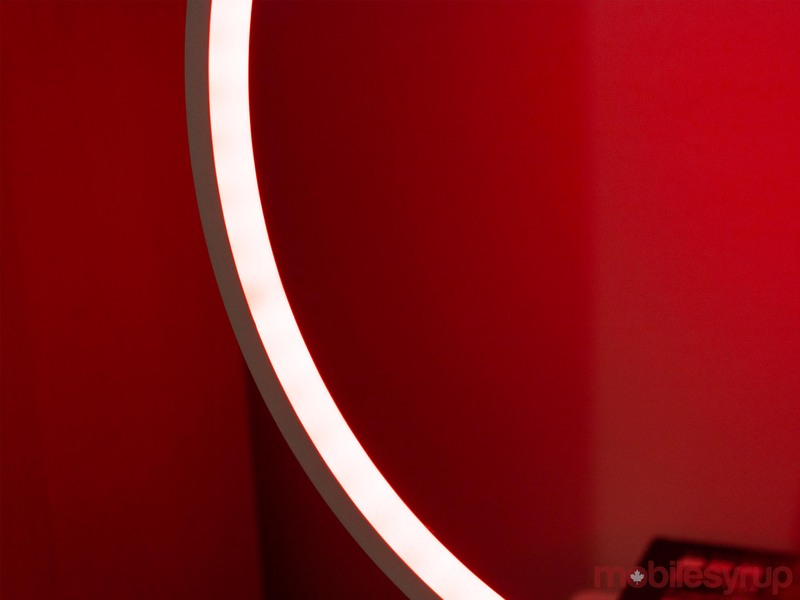 From a ring light for your burgeoning YouTube channel to a unique reading lamp, the Aura can handle just about any need you have of a light. It also offers several lighting options, presets and colours. All told, there’s a lot packed into this lamp that helps justify the $120 price tag, especially compared to other ring lights on Amazon. In a preliminary search, I found most quality ring lights available were in the same price range but lacked the versatility of Aukey’s lamp. That said, the Aura misses on a few key areas that I think would make it a significantly better buy for most people. Assistant and Alexa support, or even just the ability to control the light with a smartphone app, would have made the Aura an easy sell. Ultimately, unless you really need the ring-shaped light, I think you’d be better off with something like a LIFX Wi-Fi smart bulb. LIFX bulbs offer many of the same features along with Assistant and Alexa support, options to control the light with your phone and, depending on the light you buy, a lower price too.